The Christmas season comes alive with Delvena Theatre Company’s production of the beloved story of A Christmas Carol by Charles Dickens. A dramatic reading of A Christmas Carol, complete with period costumes, by a narrator and two professional actors with more than 60 years experience among them. Watch in fascination as Marley comes back from the dead to help Scrooge amend his miserly ways here on earth and transform himself in a pleasant, giving old gentleman. 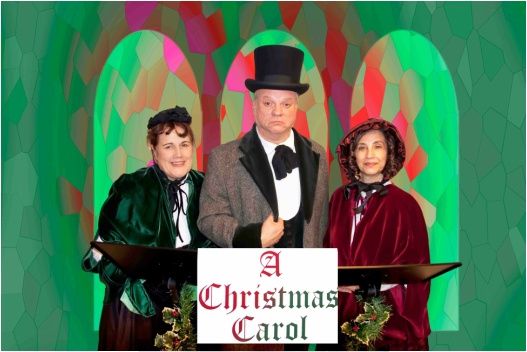 With the help of three ghosts – the Ghost of Christmas Past, Ghost of Christmas Present and the Ghost of Christmas Future –the audience will be mesmerized as old Scrooge takes a long look at his life and reevaluates its path. Classic Christmas music puts the finishing touch on this wonderful message of hope and love – so fitting for the Christmas season!